Jacob Obrecht (born Ghent, 1457 or 1458; died late July, 1505) was a composer from the south Netherlands. He was one of the greatest composers of his time. He is best known for his church music, including many masses as well as motets and songs. Obrecht’s father was a trumpeter. His mother died when he was about 2 years old and his father remarried. We know nothing about Obrecht’s musical education. He may have learned to play the trumpet like his father, who worked for the Burgundian court. Perhaps his father introduced him to people at the court, such as the famous composer Antoine Busnois. He certainly must have known Busnois’ music. From 1480-1484 he was a choirmaster at Bergen-op-Zoom. Then he got a very good job as choirmaster at Cambrai Cathedral. However, a year later he took another job in Bruges. He wrote a lot of church music during his years in Bruges. He travelled to Italy and went to the town of Ferrara where a lot of famous musicians worked. He stayed there for several months. This may have been the reason why he then lost his job in Bruges. 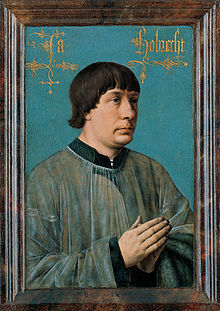 His next job was in Antwerp where he worked from 1492 to 1498. He then got his old job back in Bruges. From 1501 to 1503 he once again worked at Antwerp where he was choirmaster at the church of Our Lady. In 1504 he got the job of maestro di cappella at Ferrara, but the following year he died of the plague. Obrecht composed extremely quickly. He is supposed to have written one of his masses in one night. This was different to Josquin des Prez who spent a long time composing his pieces and making changes to them before he let anyone have copies. Obrecht was influenced by the music of Busnois and Ockeghem. Obrecht himself was a big influence on Josquin, even though Josquin was older than Obrecht. In recent years musicologists have studied Obrecht’s music a lot and made many discoveries, including the correct dates for many of his works. This page was last changed on 20 April 2013, at 03:07.